The striking and unmistakable most common of Ethiopia’s endemic large mammal species, with a population estimated by some to be as high as 700,000. The male Gelada is a spectacular handsome and unmistakable beast, possessed of an imposing golden mane and heart shaped red chest patch, which serve the same purpose as the colorful buttocks or testicles found on those African monkeys that don’t spend most of their lives sitting on their bums. The Gelada is the only mammal’s endemic to Ethiopia that cannot to some extent be regarded as endangered. This singular primate is unique in its feeds predominantly on grasses, and it is probably the most sociable of African monkeys, with conglobations of 500 or more regularly recorded in one field. It has a harm based social structure that is regarded to be the most complex of any animal other than human. In evolutionary terms, the gelada is something of a relic, the only surviving representative of a genus of grazing monkeys that once ranged far more broadly across Africa. The gelada stock is ancestral not only to the modern baboon that have largely displaced them in savanna and other open habitats, but also to the baboon like drills of west Africa and to the smaller and more arboreal mangabeys, both of which readapted to the rain forest habitats. 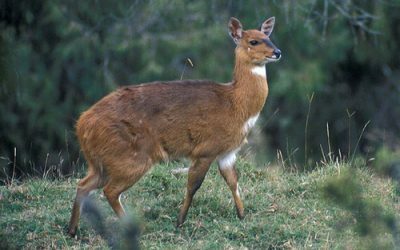 This endemic species is distributed throughout the northern highlands, where it is generally associated with cliffs and ravines, and one can see them as soon as he/she over landed in the Simien Mountains National Park, which forms the species’ main stronghold, and they are also numerous on the Gussa Plateau. They are often seen in the vicinity of Ankober, Debre Sina, Debre Libanos and the Muga River gorge near Addis Ababa.